Captain Bob Eskew and his crew at Blue Water Explorers should be noted for their professional and safe charter services to over 100 different dive sites out of Sarasota/Bradenton, Florida. 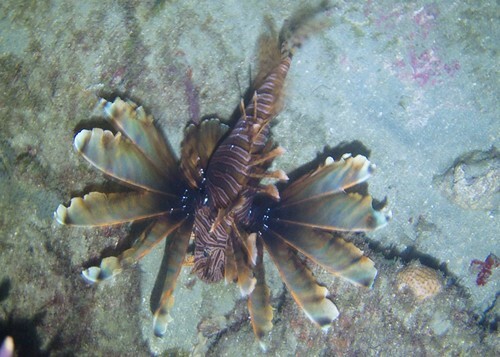 I started diving with this charter in November 2011 and have not been disappointed since. The reefs are primarily artificial, either construction debris or shipwrecks, although a few natural reef patches can be explored as well. 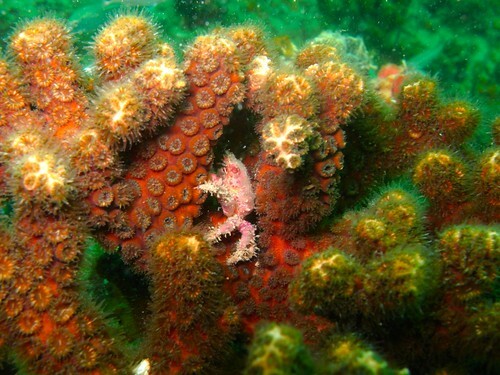 Colorful encrusting sponges, sea whips, sea fans, and natural corals decorate the otherwise dull metal and wooden structures. 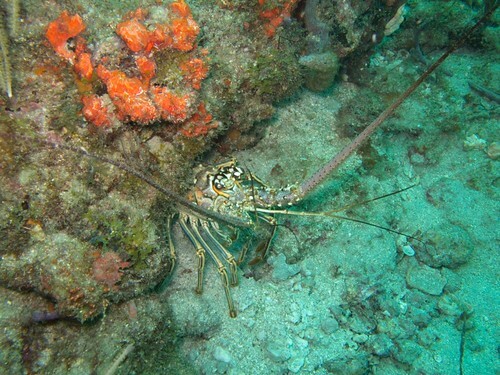 An array of tropical and subtropical fish live on the site, from small spider crabs to large Goliath groupers. 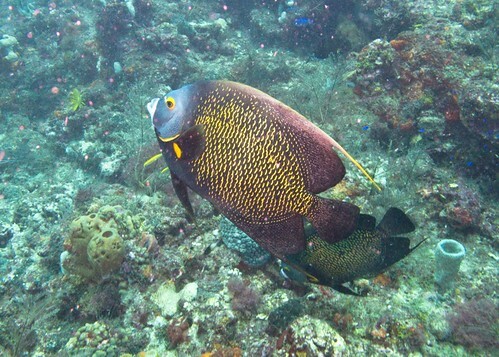 The occasional angelfish quickly darts by, obscured by shadows before the camera can fully capture its presence. 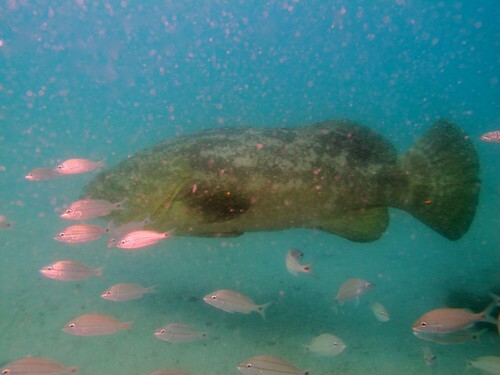 Atlantic Goliath groupers (Epinephelus itajara) are listed as Critically Endangered by the IUCN. 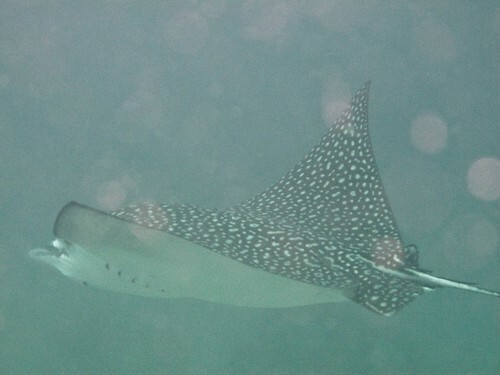 These normally timid creatures can grow up to 8′ long and weigh around 400 pounds when mature. Hidden in the sand, flounders could be found throughout the site. 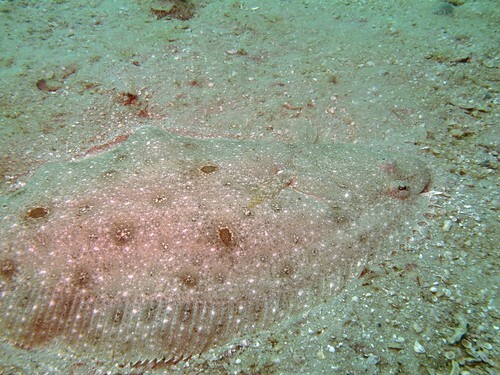 Gulf flounder (Paralichthys albigutta), like the one pictured below, are a popular target for recreational and commercial fishermen, as well as spear divers. There is no current management scheme for flounder, making the species vulnerable to overfishing. 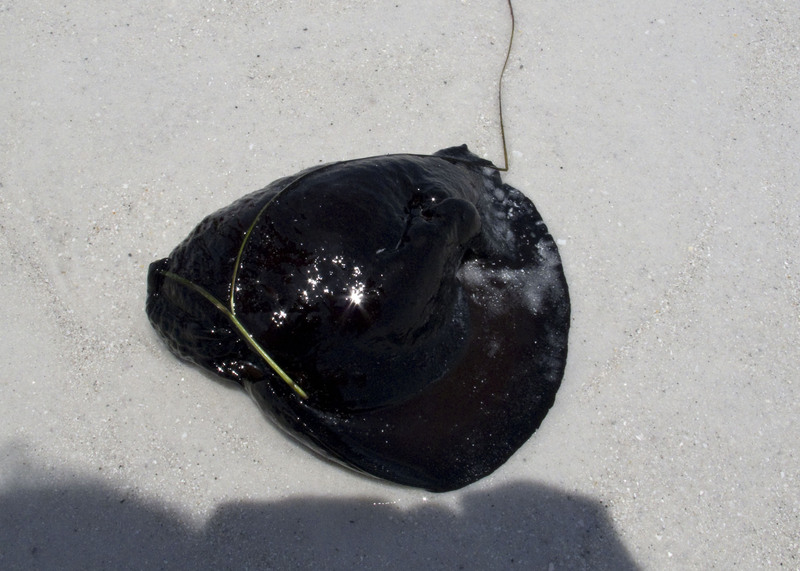 Atlantic Spadefish (Chaetodipterus faber) are another popular target for commercial fishermen. These fish, similar to angelfish in appearance, can be found in schools in shallow waters off the coast of the Gulf of Mexico and Caribbean. They can grow to medium to large sizes, making the fish a challenging catch for recreational fishermen. There is no current fishery or management scheme to monitor the status of this species, which could put it at risk to overfishing. A Sheepshead (Archosargus probatocephalus) peeks out from an old tire, likely placed there in the hopes of building more reef. 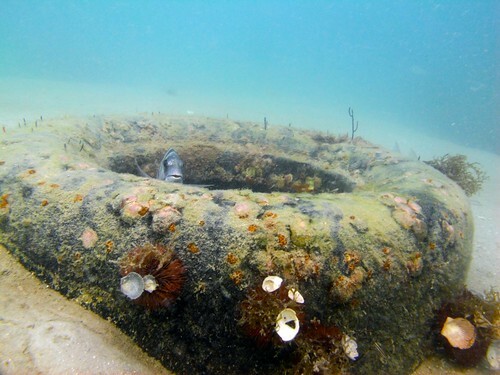 Car tires were falsely believed to be good support for artificial reefs. 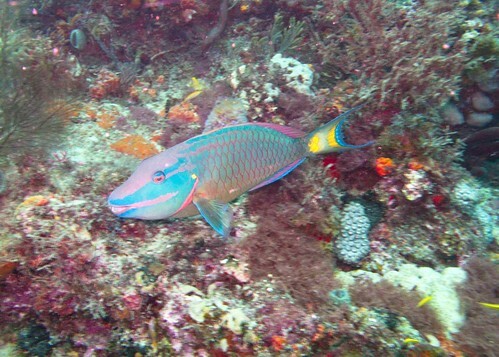 Due to their lack of weight underwater, and ease of mobility, they fail to provide the firm substrate necessary for successful reef building. Sheepshead are similarly colored to the Spadefish, with silver and black vertical bars and generally a medium-sized fish. Found throughout the Gulf, sheepshead are another popular catch for recreational fishermen. 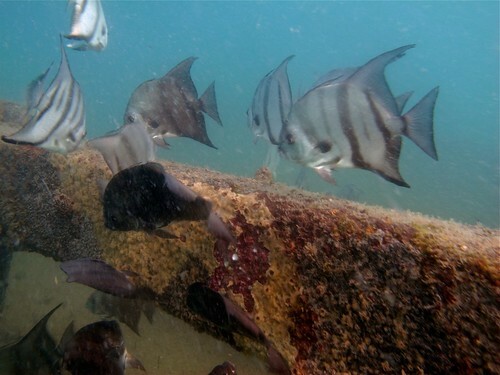 The presence of commercially and recreationally important fish, endangered Goliath Grouper, and fragile corals and sponges are a testament to the success of this artificial reef, and its importance as a site for robust biodiversity and a thriving marine ecosystem. Overall, the conditions at both sites were good. 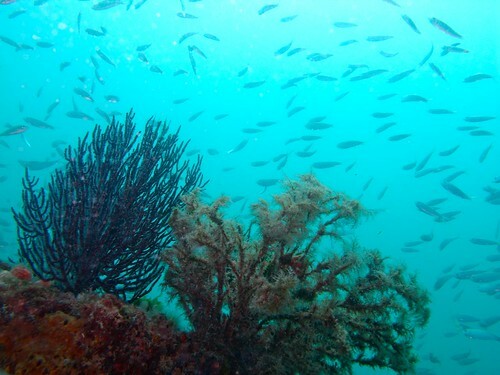 Light winds, relatively flat seas at the surface and no current or surge present at the dive site. The interdependence of human society and the ocean is a theme that encompasses global environmental, political, and social interactions. The ocean provides endless direct, and indirect, goods and services that benefit all humanity, from the rich protein of fish to oxygen creation and carbon storage. Yet our false conceptions of the “renewable” water cycle and that there are “always more fish in the sea”, lead us to overfish and pollute our oceans. For now, I am working as a summer intern, and as the U.S. Coordinator, for the new Cousteau Divers Headquarters in St. Petersburg, Florida. I am also training to become a PADI Dive Master. 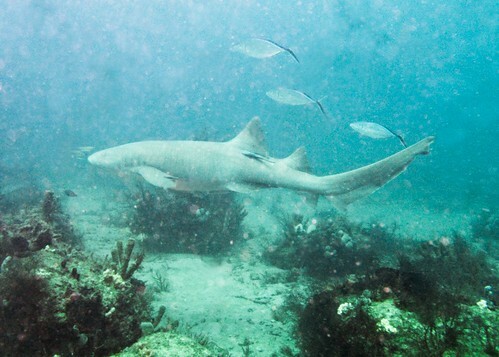 On the weekends, I explore the rich biodiversity and habitats along the coast of Florida through diving. During the week, I spend my hours researching and meeting with other knowledgeable individuals to find ways of promoting the protection of marine life. For starters, I am designing a data collection method that any diver, or snorkeler, could use to record and upload their observations to the Cousteau Divers website. With the help of some students from the Canterbury School, I am sure this will become an educational tool for both the divers and those following the data uploaded to the site. When the BP Oil Disaster happened in 2010, we had no idea what the long-term effects would be, what the immediate and long-term socio-economic costs would be. While the oil and dispersants are no longer visible, we still don’t have any idea as to what the long-term effects may be. 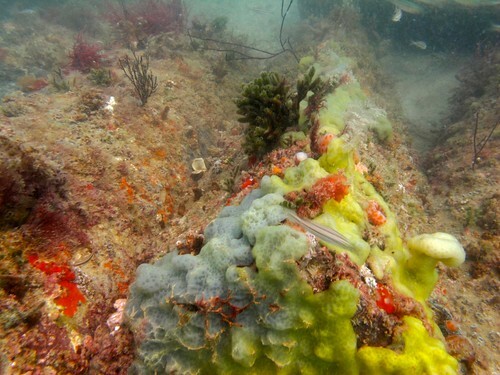 This incident highlights the importance of having an established monitoring system and baseline understanding of marine ecosystems, so that when an accident does occur, we can better understand and respond to the impact. 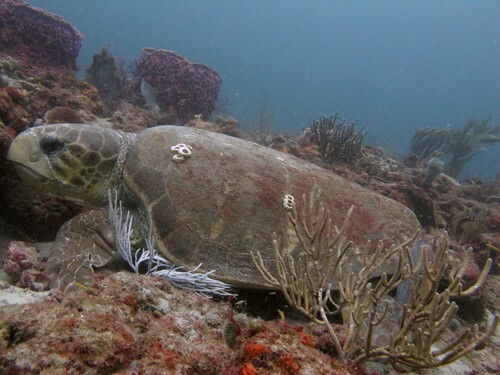 I hope that divers, snorkelers, and just regular people throughout the Gulf coast and Caribbean will participate in and contribute to the Cousteau Divers program, so that we can better understand the health of our ecosystems and be better empowered to protect and restore them. This blog serves as a space where I can talk about ongoing projects, and problems, in the Gulf of Mexico. Where I can post photographs and videos of what I find during my underwater adventures this summer. I also hope to turn it into a resource for anyone hoping to make a more positive impact on our oceans.